Fira Santorini. The capital of the island. Fira Santorini, is the capital of the island. As it is the largest settlement on Santorini, you will probably visit it or pass through it, no matter where you will be staying. Our ancestors built the modern Fira Santorini on an altitude of 250m. above the Aegean Sea during the 18th century. This was necessary due to the earthquake which destroyed the former capital of Santorini, Kasteli, today’s Imerovigli. From that time Fira became the financial core of Santorini. Today, Fira Santorini hosts thousands of visitors every year. Local residents managed to maintain its traditional architecture and values. Yet during your visit, you will “feel” the combination of modern and historic touch. It is really difficult to get bored in Fira Santorini. Because of its size and demand for practically every service, you will not miss anything here. Starting with cuisine, you will find a variety of choices. Of course, the most often seeing are the traditional taverns. Due to the rich cuisine of Santorini, we suggest you start your culinary journey from here. Probably the most famous product of Santorini, served on diner tables all over the world is the wine. The choices are so many, that you will have to take few bottles with you back home. Split peas, cherry tomatoes, katsouni (local cucumber) and eggplant are just few ingredients that inspire many recipes. You should know that seafood and fish are caught on daily basis by local fishermen. Afterwards the products are delivered to taverns and restaurants all over Santorini. If you don’t mind spending little bit more money, you can visit one of award-winning restaurants of Fira Santorini. The dishes will amaze you and only because of the taste, but also due to the food styling. Don’t forget that there is always Greek gyros for those who want to grab a quick bite. Fira Santorini hosts also restaurants that offer foreign cuisine. Chinese, sushi, Italian are the most common choices after Greek dishes. You should dedicate time to explore Fira Santorini and its picturesque alleys. Most of the buildings lay on the impressive cliffs. Among them, you can take many evening walks and you won’t be able to discover all the alleys in just one day. Just have in mind that almost in every corner there is a potential to take a stunning photo. You can make a collection and show it back home. If you are one of the people that like to walk, you should descend by foot from Imerovigli to Fira. Even if you don’t enjoy walking, you will be impressed. The path is located on the cliff side. Therefore, the amazing Caldera view will accompany you until you reach the center of Fira. 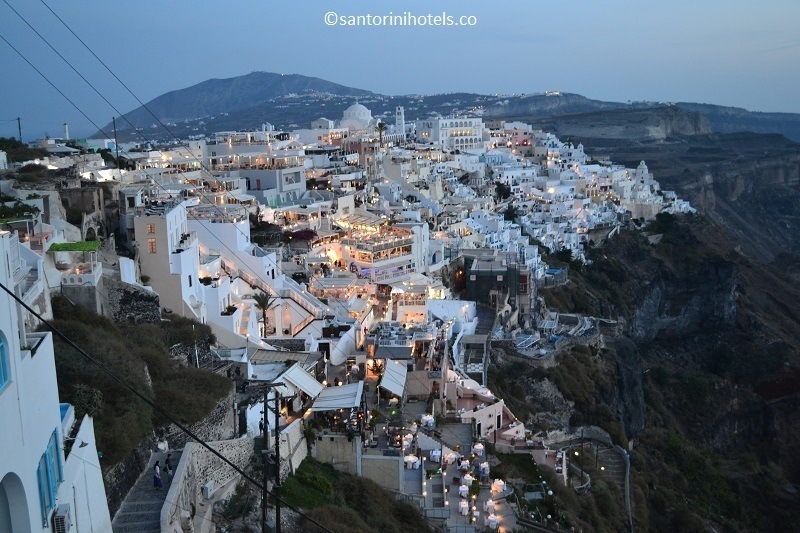 There are so many sights here in Fira Santorini that you will not know from where to start. Let us help you with that. You can start by visiting the old port and taking a ferry towards the volcano. This is a daily trip. Just make sure you will start early, in order to be back to Fira for the stunning sunset. The Museum of Ancient Fira is also interesting, as well as a visit to Akrotiri and the Ancient City of Fira. This city was built on a top of a hill between Kamari and Perissa beach. Fira Santorini is the center of the bus line. From here, there are schedule towards every part of the island. This is quite suitable for tourists that stay in Fira. Without the need for changing the bus, you can get everywhere.